If you haven’t heard, several counties in West Virginia are in a state of emergency because of a chemical leak in the Elk River. It got into the water supply of 300,000 people. Until further notice all we can do with the tap water is flush the toilets and put out fires. No drinking, cooking with it, or bathing in it. The water company issued the “do not use” order Thursday. Restaurants and bars have had to close temporarily. (See the Charleston Gazette’s coverage for more details). 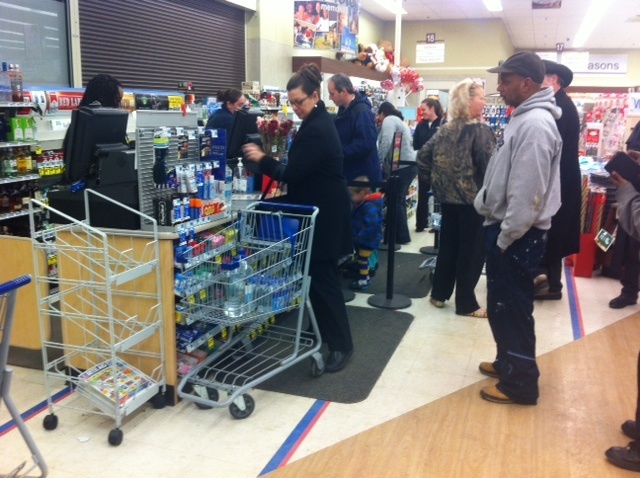 This was the scene at Rite Aid on Charleston’s East End Thursday night when West Virginia American Water issued a “do not use” order on several counties in the region. People rushed to the stores to buy bottled water. 1. Let’s keep looking out for our neighbors. I know this goes without saying. West Virginians take care of each other. I’m so thankful for the friends who have offered to help in anyway they can. A friend with clean water let me shower at her place. She also bought bottled water and gave it to a mother of four who couldn’t find any because stores were sold out. People have been quick to post to social media when they see a water distribution site or see a grocery store with a full stock. Let’s keep finding ways to help each other. 2. West Virginians have a good sense of humor to be dealing with this while making jokes. So much of my Facebook and Twitter feed has been filled with people making light of the situation. There will be time enough to get angry and place blame — and believe me, we should. But right now, a little humor isn’t hurting. 3. Let’s be kind to the national reporters who have descended on this place. As a local reporter here, I’ve always found West Virginia residents to be gracious with me while I’m working on a story. I hope the others from out of town are treated the same way. This may be the only time some of them ever come to West Virginia. I hope they leave with a real impression of what amazing people live here. 4. If nothing else, let this teach us not to take for granted our most precious commodity. Yep. I heard. I’m in the middle of it. I should try harder to not look at natl media and get that “You shall not pass, outsiderrrrr! !” feeling. It’s tough when you feel kind of attached to a story, y’know?